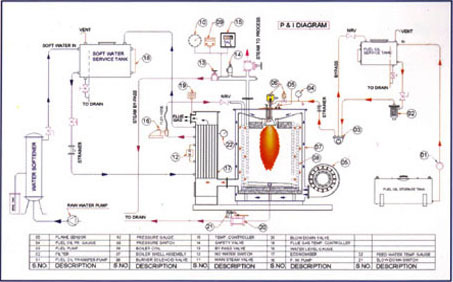 Steam Boilers, Oil, Gas And Solid Fuel Fired Steam Boilers, Electric Steam Boiler, Coil Type Steam Boilers, Mobile Steam Generators, Industrial Boilers, Boiler Accessories, Manufacturer, Exporter, Supplier, Pune, Maharashtra, India. Majorly we export products to customers from Gulf, Asian & African countries etc. VAPOMAX is a Coil Type Vertical Steam Boiler Range- from 50 Kg/Hr. to 1,500 Kg/Hr. Up to 850Kg/Hr. are Non IBR Boilers. VAPOMAX produces steam within five to six minutes from cold start. This time will vary as per capacity of Boiler. clean combustion, almost free of air pollutants. • Thermal Efficiency of 88%±2. • Due to Coil Type design & Maximum safeties incorporated, there are no explosion hazards. VAPOMAX is a fully automatic boiler in any abnormal conditions either due to no oil, no water, high steam temp., high stack temp., blow down valve open, VAPOMAX shuts off & gives alarm, indicating fault on control panel, so we can easily rectify the fault.